If you have always wanted to learn how to weave but have been intimidated by the expense and bulky size of traditional weaving looms, try to build a wooden weaving loom for yourself instead. When you build a wooden weaving loom you only need basic woodworking skills and as much space as the desired size of your loom. Finish your DIY weaving loom and then see how many ways you can think of to use it for unique woven creations. Determine the size you want for your weaving loom. If you only want to make a scarf, then a loom that is approximately three yards long by one foot wide might be sufficient. If you prefer to make a shawl or wrap or some other large item, then you will need to increase the size of your loom to accommodate this; in general, add a few inches to your desired width and height for your finished projects and this will be the size your loom needs to be. Find wood that is approximately two inches thick and meets the length and width requirements for your loom. For a scarf loom, one long plank of wood might be enough to accommodate your size by itself. If you want a larger loom then you will need to construct a frame, so you will need two planks in your desired length measurements and two for your width measurements. Position your first short plank of wood flush against your two long planks to form the top of your frame. Drill two screws through the flat side of the short planks into the ends of the long planks. Repeat step three for the bottom of your loom frame. Measure every 1/2 inch across the top of your loom and mark these points with a pencil. Repeat this step for the bottom of your loom. Hammer a nail into the spot marked by each 1/2 inch increment on the top and bottom of your loom frame. These nails will serve as the pegs to wrap your warp thread for your loom. 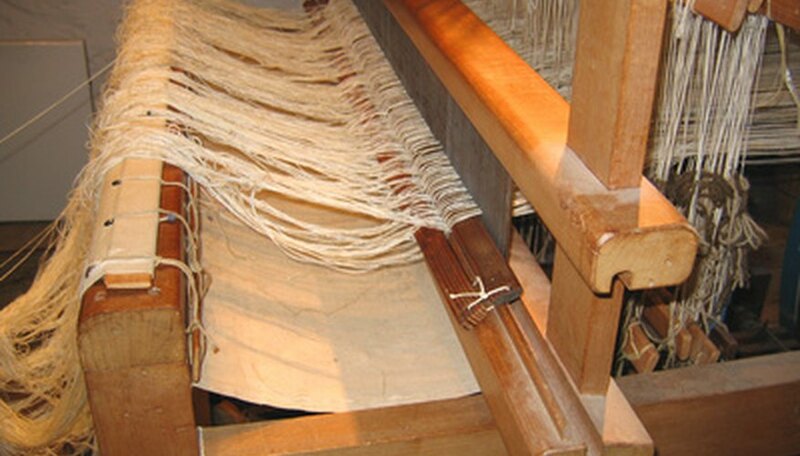 Make sure you line them up evenly on the top and bottom of the loom. When you get ready to weave, wrap the warp thread around more or fewer nails to increase or decrease the width of your woven items.